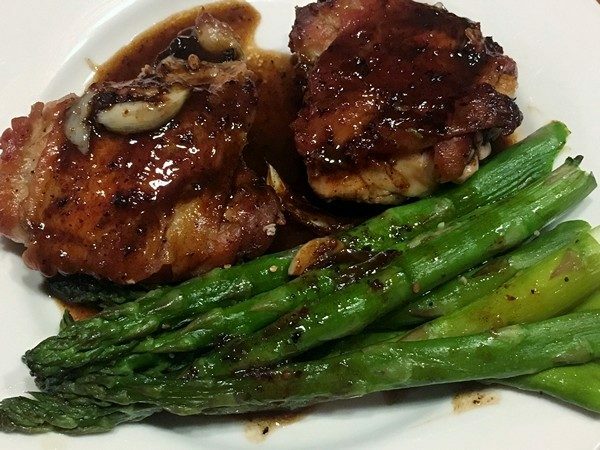 I love chicken thighs and this recipe from bon appétit looked easy and delicious. Serves 2-4 depending on appetite and size of thighs. Pat chicken thighs dry and season well with salt and black pepper. Place in a large resealable plastic bag and add vinegar. Seal bag and gently massage chicken to ensure all thighs are coated in vinegar. Chill 1 hour. Preheat oven to 400°. Remove chicken thighs from bag and pat dry with paper towels; the drier the skin, the crispier it will be when cooked. Place chicken thighs, skin side down, in a dry large cast-iron skillet and set over medium heat. Cook undisturbed until they easily release from the pan, about 4 minutes. Continue to cook, moving chicken around occasionally to ensure the skin is cooking evenly, until golden brown, 8–10 minutes. Add garlic and transfer skillet to oven. Bake until chicken is cooked through, 10–12 minutes. Transfer chicken and garlic to a plate. Set skillet over medium-high heat and cook lemons, cut side down, until edges are deeply charred (they should be almost black), about 5 minutes. Transfer to plate with chicken and garlic and let cool slightly. Squeeze lemon juice into a small bowl; add garlic, honey, and Aleppo-style pepper and whisk to combine. Whisk in oil and any accumulated juices on plate with chicken. Season vinaigrette with salt and black pepper. Drizzle half of vinaigrette on a platter and set chicken on top. Serve with remaining vinaigrette alongside and enjoy! My verdict: This was good, tasty, but not one of the best (or easiest) chicken thigh recipes I’ve made. One of the major issues I had was that you’ve got a pan full of great browned chicken bits (fond, if you want to get technical) and there’s no call to do anything with them. 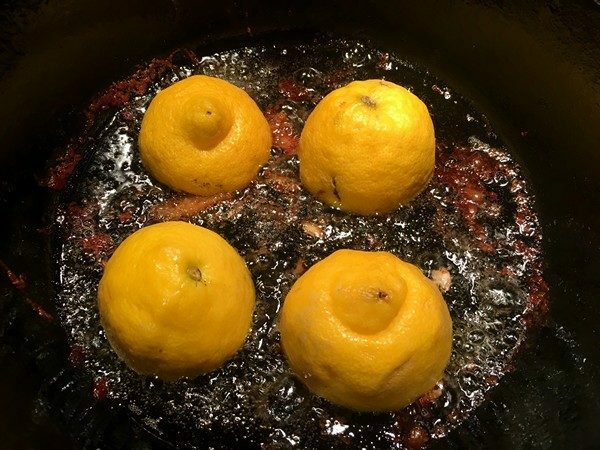 I couldn’t let all that great flavor go to waste so after cooking the lemons, I deglazed the pan with a little white wine (chicken stock or water would work fine), scraping up the browned bits. Once that was done, I added the vinaigrette, let it cook down a bit (smashing up the garlic as it cooked) and served that as a sauce over the chicken. The other problem came juicing the lemons. They were slippery from being in a greasy pan and I ended up picking countless pits out of the bowl, so using a juicer or reamer might be a better idea than just juicing them into a bowl. I’m thinking this might be just as good (and easier) done on a sheet pan in a 400° oven and roasting the lemons and garlic along with the chicken. What do you think? 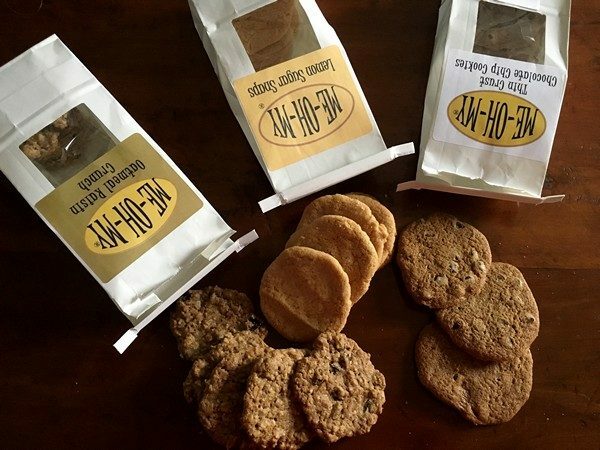 MeOhMy Cookies: The Best Chocolate Chip Cookie? For a while, I’d given up my quest for the best chocolate chip cookie. All the ones I’d made were acceptable, and we ate them, but nothing had come up to the gold standard set a few years ago at a lunch for Blue Star Ranges. However, that was about to change and right in my backyard, so to speak. In the back of Jeanie Beans, our favorite lunch spot, there’s a whole cookie making operation going on. Little did I know that Deb, the founder and creator of MeOhMy cookies, was turning out her delicious treats 10’ away from Jeanie’s delicious fish and chips. 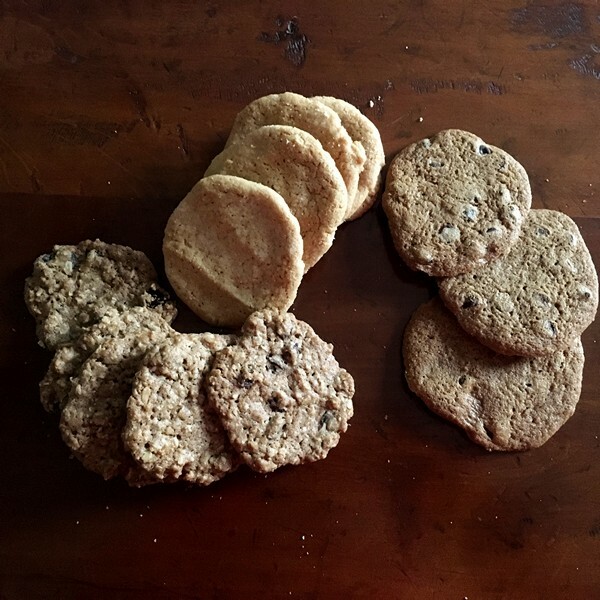 I’d seen the bags of cookies there and almost grabbed one the other day in my search for chocolate chip nirvana (because, trust me, it’s not coming from my kitchen). Hers are thin and crispy which, after much consideration, is how I like them. If you’re the thick and chunky tifosi, you can probably skip the rest of this piece (or just comment about how wrong I am). She makes them in small batches, with local ingredients whenever possible. Besides the chocolate chip, there’s an oatmeal raisin crunch, a lemon sugar snap and a toffee almond with coconut. The chocolate chip are my favorite and a Hudson Valley Best of winner. They’re thin with crunchy buttery edges, a perfect ratio of (good—Callibut) chocolate chips and a buttery goodness. Supposedly, there is a hack on the Internet for warming up chocolate chip cookies in the microwave. Deb tried it at Jeanie Beans in her old and weak microwave for a minute and it was great (hey, what’s better than a warm chocolate chip cookie?). I tried it at home and in 33 seconds had a roaring fire burning in my microwave (and one less cookie). When Deb said she had tried it at home with the same results, I decided that they were fine just out of the bag! Oatmeal raisin cookies are one of those cookies that have to prove themselves to me. Normally, I don’t like raisins sneaking around in things, but they’re called oatmeal raisin for a reason, so they get a pass. These might also vault up to the top of my list for oatmeal raisin. There’s something in them that does give you nice crunchy bits, along with the softer centers, a crispy edge and just enough raisins. That is of the two I managed to sneak away from my husband who after the first cookie, commandeered the rest of the bag. The last of the ones I’ve tried are the lemon sugar snap. It’s the thickest of the three, with a nice buttery shortbread quality and a hint of lemon that enhances but doesn’t overwhelm the cookie. Deb says on her website that they’re “a perfect treat at the end of the day with a cup of tea” but why wait for the end of the day? While the toffee almond with coconut sounds like it would be a true contender with the chocolate chip, sadly I’ve not tasted them because of an old nut allergy. Better safe than sorry, but they do look delicious! You can order MeOhMy cookies on her website. If you go for the 4-bag assortment, you can mix and match to your heart’s content. There are also a number of stores in and around the Hudson Valley that carry them. Click here for a list of retailers. What’s a Lemon LuLu Cake? I’d never heard of a Lemon LuLu Cake, but happily, that changed recently. To me, there’s nothing better than a surprise package arriving on my doorstep with something delicious inside! Sweet or savory, packages bearing food are always welcome! Also great is finding out about something yummy that you didn’t even know existed. 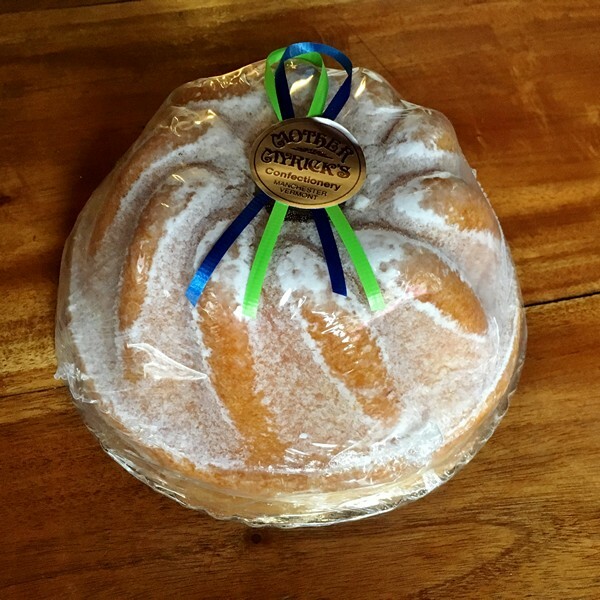 Mother Myrick’s, of Manchester, Vermont, happily filled both those roles recently. The goodies arrived the next day, perfectly packaged and in pristine shape—not a crumb out of place. There was their signature Lemon LuLu Cake and a box of Buttercrunch. It came with a lovely, hand-written card that turned out to be from a place I know up in Maine, so I was already inclined to like it. The Lulu cake is a lemon pound cake. 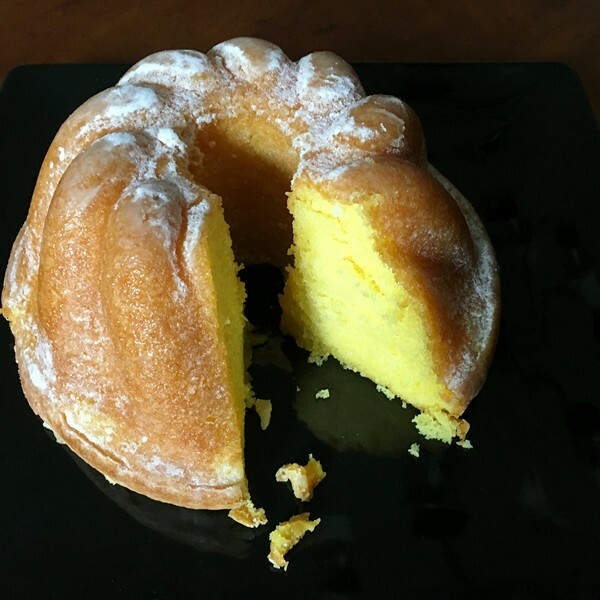 It’s a lovely, light, moist cake, with a lemon glaze and a sprinkling of confectioner’s sugar. I’m sure it would be great with some fresh berries and/or ice cream, but ours disappeared before it could be paired with anything except a fork. If you were ever in need of an “emergency cake,” Lemon Lulu cake can be frozen, or you can just order one for next-day delivery. No need to turn on the oven all summer! 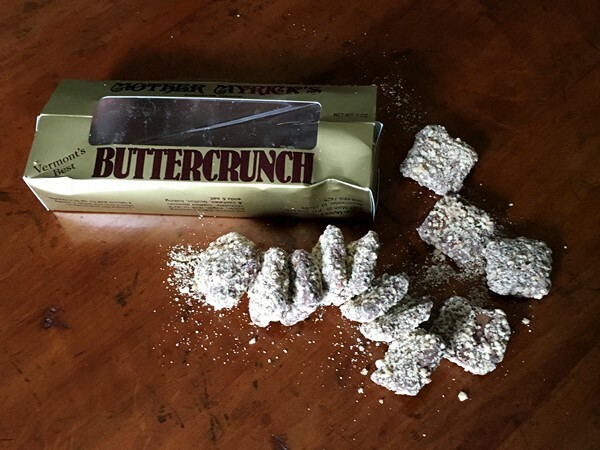 The Buttercrunch, another signature item, looked and smelled amazing. I say that because, sadly, I couldn’t taste them, so we have to take Janet’s word that they were really buttery and she liked it a lot! There are lots of other goodies in their catalog or online, so if you have a hankering for something sweet and don’t feel like heating up the kitchen, just relax, shop and enjoy! Artichokes are one of my favorite vegetables! I could eat them all the time and in any preparation. 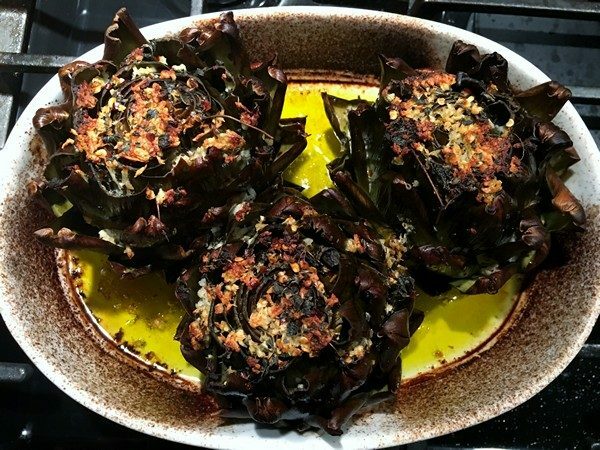 When I saw this recipe in Saveur for roasted artichokes, it seemed like an easy way to fix them—just roast them for a while and enjoy. In a medium bowl, whisk together oil, wine, oregano, chile flakes, garlic, and salt and pepper; set aside. 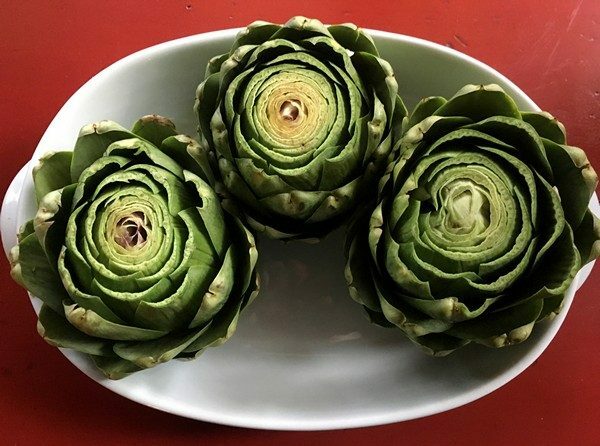 Cut 1″ off the top of each artichoke and gently pull leaves apart to open artichokes. Place them, standing up on their bases, in a small roasting pan or dish large enough to hold them in one layer. Pour oil mixture over each artichoke, making sure it reaches in between all leaves. Cover with aluminum foil, and bake for 45 minutes. Uncover, and bake, basting often with juices, until browned and tender, about 30 minutes more. Let cool for 10 minutes. Serve warm with pan juices and enjoy! My verdict: Sadly, not a winner. I’m not sure if it was the artichokes or the recipe but they were tough. I used a 450° oven as I was roasting a chicken and didn’t think it would be a huge difference, but after 90 minutes, they were pretty leathery. I wrapped them and tossed them in the microwave to steam them for about 5 minutes and it made them edible. There was too much taste from the red chile flakes and not enough from anything else so we used some stray hollandaise sauce to liven things up. Here’s where I think things might have been improved: pre-steaming the artichokes in the microwave for 5 minutes and them roasting them as above. Or, pre-steaming them, dousing them with the sauce (minus a few red chile flakes and maybe plus some lemon) wrapping them up in foil and tossing them directly in the fire of a charcoal grill. 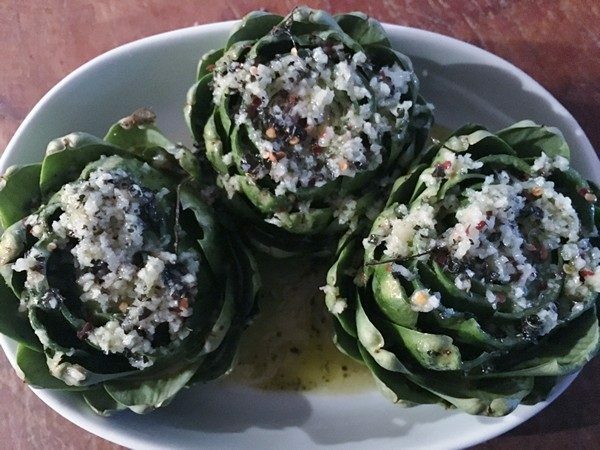 Have you ever made artichokes this way? How did they turn out for you?